NOTE: The editorial policy of this website is to present only the pristine and original teachings of Jodo Shinshu (Shin) Buddhism. Before we link to any other website, we investigate that website to make sure that they do the same. We reject any website that presents false or divergent teachings, or that links to other websites that present false or divergent teachings. Permission is hereby granted to clone, translate and/or publish this website into any language, no additional permission is required. Into the light of Diamondlike Faith and Assurance of Buddhahood. Into the everlasting blessedness of Nirvana at this life's end. As revealed in the great Sutra of Your Limitless Life. May I honor and bless you forever, Amida my savior! Jodo Shinshu Buddhism, or Shin Buddhism, is based upon the teachings and writings of Shinran Shonin (1173-1262) and Rennyo Shonin (1415-1499). "Shonin" is a Japanese term that means "sage" or "master." "Jodo Shinshu" means literally "True Pure Land Sect." How joyous I am, Gutoku Shinran, disciple of Sakyamuni! Rare is it to come upon the sacred scriptures from the westward land of India and the commentaries of the masters of China and Japan, but now I have been able to encounter them. Rare is it to hear them, but already I have been able to hear. Reverently entrusting myself to the teaching, practice and realization that are the true essence of the Pure Land way, I am especially aware of the profundity of [Amida] Tathagata's benevolence. Here I rejoice in what I have heard and extol what I have attained. Master Shinran expounded the "True Pure Land Way", or the path whose "practice" is LISTENING DEEPLY to the Dharma preached by Shakyamuni Buddha in the Larger Pure Land Sutra. This practice entails total faith in and reliance upon Amida Buddha, the Buddha of Infinite Light and Life. Then who is Amida Buddha? Amida Buddha is a "samboghakaya" buddha or "transcendental" buddha, who was revealed to the world in three great Mahayana sutras expounded by the historical Buddha, Shakyamuni, who lived and taught in India ca. 563-483 BCE. Amida Buddha began as a mortal, a king, who sought enlightenment under the then-living Buddha of his world, named Buddha Lokeshvararaja, whom we read about in the Larger Pure Land Sutra (The Larger Sutra on the Buddha of Eternal Life). This king relinquished his rule and began to earnestly study the Buddha Dharma, and he took the Dharma name of Dharmakara. After many years of difficult practices he became a bodhisattva. (A bodhisattva is a person on the brink of buddhahood who brings the Dharma to suffering beings in advance of his own enlightenment.) His name, Dharmakara, means "Dharma-storehouse." Bodhisattva Dharmakara asked Buddha Lokeshvararaja to show him all the billions of buddha-lands of the cosmos. When he was granted this request, Bodhisattva Dharmakara determined to create a Pure Land of his own, containing all the virtues of the other buddhas' buddha-lands but without any of the evils in those buddha-lands. He then became moved to make 48 Vows detailing the attributes of his Pure Land which he intended and vowed to create. "If, when I attain Buddhahood, sentient beings in the lands of the ten quarters who sincerely and joyfully entrust themselves to me, desire to be born in my land, and call my Name, even ten times, should not be born there, may I not attain perfect Enlightenment. Excluded, however, are those who commit the five gravest offences and abuse the right Dharma." Other Buddhas vow to save all beings but through their performing various difficult practices that only talented people can successfully perform and only through very many lives. Bodhisattva Dharmakara wished to create a special buddha-land where ALL beings can IMMEDIATELY be saved and become fully enlightened buddhas, whether male or female, young or old, good or evil, educated or illiterate. According to the Larger Sutra, Dharmakara vowed that he would not allow himself to be enlightened until this Buddha land (the Pure Land) and all its powers were thus created. After five kalpas (many billions of years) of deep contemplation, Bodhisattva Dharmakara fulfilled all of his 48 Vows and as a result he became the Buddha known as Amida and his Pure Land came into being. In Amida's buddha-land (what we call the Pure Land or Sukhavati), the sincere petitioner who takes singleminded refuge in Amida Buddha - including the most evil reprobates - are saved and will, after death, be reborn and attain enlightenment (Buddhahood) without the confusing and conflicting pains and distractions of mortal existence and bypassing what would, without Amida's saving grace, be countless rebirths in the lower realms of suffering. The other 47 vows of Dharmakara Bodhisattva, now Amida Buddha, are about the special features of his Pure Land and the powers of Amida Buddha once Dharmakara attained buddhahood through the fulfillment of all 48 vows. Why did the World-honored One come into this world? We should believe the Buddha's true words. Thus Amida Buddha must be considered the greatest of all buddhas because He extends salvation from the world of suffering to all - whether good or evil, young or old, male or female - who simply take refuge in Him and attain that state of settled faith known as SHINJIN or "the mind of faith." Amida Buddha's work of saving suffering beings will not be completed until ALL BEINGS are Buddhas. This is why Amida goes by two names, AMITABHA (Limitless Light = Infinite Wisdom) and AMITAYUS (Limitless Life = Boundless Compassion). True Shin Buddhism teaches that there is no calling greater than attaining SHINJIN, and moreover, that attaining SHINJIN is the sole objective of the Nembutsu path, reciting "Namu Amida Butsu" (I take refuge in Amida Buddha) singlemindedly and with simple gratitude for the benevolent salvation that we receive in this life with the promise of Buddhahood at the end of this life when we go to the Pure Land (jodo) of Amida Buddha. By "attaining SHINJIN" is meant receiving the blessed gift of SHINJIN from Amida Buddha through His transferred merit to all beings who take singleminded refuge in Him. The transferred merit is through the OTHER POWER (Jp. "tariki") of Amida. It is through SHINJIN that we are guaranteed Birth in Amida's Pure Land when this life comes to an end. Once born in Amida's Pure Land, we attain buddhahood, we become buddhas ourselves. No self-power or calculation by the aspirant is necessary to attaining SHINJIN. In fact, self-power (Jp. "jiriki") and calculation only get in the way of Amida's saving Other Power. To receive Amida's gift of SHINJIN one must acknowledge completely that one is incapable of achieving buddhahood through one's own self-power, and then one must take singleminded refuge in Amida Buddha. SHINJIN therefore is attained by placing one's ENTIRE KARMIC DESTINY in the care of Amida Buddha. It is as simple as that. But people are filled with doubts, delusions, and obscurations that make it hard to believe attaining SHINJIN can be so easy. This is where it is important to have a good teacher; further, one's karmic connection to Amida Buddha must be ripening to the point where one can accept this teaching in complete faith. The NEMBUTSU, which is pronounced "Namu Amida Butsu" in Japanese, is simply an expression of faith and an expression of gratitude to Amida Buddha. It is not a "practice" in the sense that it accomplishes any spiritual goal. It, itself, does not cause birth in Amida's Pure Land. It is simply an outflowing of thankfulness to Amida for His gift of salvation through His blessed gift of SHINJIN. Wish to respond in gratitude to the Great Benevolence. The Collected Works of Shinran include poems, letters, and his monumental treatise, KyoGyoShinSho ("Teaching, Practice, Faith, and Attainment of the Pure Land Way"). For a summary of some of Master Shinran's core teachings, see the Tannisho, a short book composed by his follower Yuienbo with key quotes directly from Master Shinran. Tannisho represents Jodo Shinshu Buddhism in terms of refuting specific deviations from Master Shinran's teaching which arose after his death in 1262. The issue of deviations from Master Shinran's teachings is still a problem today, expressed in terms of doubt - and often resolute DISBELIEF - about the reality of Amida Buddha and His Pure Land. Master Shinran was completely clear and unambiguous about the true reality of Amida and His Pure Land, for he devoted an entire chapter (Chapter 5) of his KyoGyoShinSho to "TRUE BUDDHA AND LAND." Such doubt and disbelief is simply an expression of ego and ignorance. Unfortunately it has been expressed by some of the leading Shin scholars, and even leading Shin ministers, of our time and represents a threat to the vitality of the greater Sangha of True Shin Buddhism as set forth originally by Master Shinran and later revived by Master Rennyo. In order for a Shin Buddhist to be a true teacher of the path of Nembutsu-faith, one must be a person of settled SHINJIN. Unless one has himself or herself already attained SHINJIN, he/she cannot understand the process of awakening to Amida's Primal Vow. And attaining SHINJIN depends upon singleminded belief and refuge in the REAL AND TRUE BUDDHA AMIDA. It is as though a person who has intellectually studied music wanted to teach someone how to play a musical instrument. Without the experience of actually knowing how to play the instrument, it would be impossible to teach someone else how to play it. The same is true of SHINJIN. It is an experience that cannot be attained or described intellectually, no matter how many books on Buddhism one might read. From today, ... seriously start to inquire into the meaning of the Great Faith of the Other-Power and obtain the determination of rebirth into the Land of Recompense. To receive this Faith of our sect, nothing need to be done but simply place deep reliance on Amida Tathagata single-heartedly. Note Master Rennyo's exhortation to "seriously...inquire into the meaning of the Great Faith of Other-Power." Master Rennyo clearly and straightforwardly advocates understanding the meaning of this faith in Other Power. A mere simple recitation of the Nembutsu without understanding its meaning is pointless. 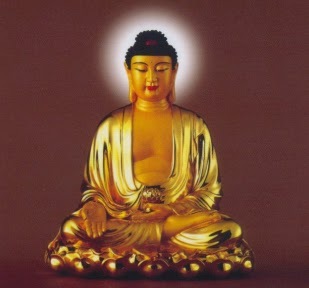 In order to "obtain the determination of rebirth", that is, SHINJIN, "into the Land of Recompense," that is, the PURE LAND OF AMIDA, one needs to understand that Amida Buddha made his great Primal Vow which embraces and does not forsake anyone, young or old, male or female, good or evil, who takes singleminded refuge in His Other Power. And, in accord with the teachings of Master Shinran and Master Rennyo, one must believe, as these masters believed, in the reality of the true and real Amida Buddha and His true and real Pure Land, otherwise birth will not be possible. Further, this belief can only come about through LISTENING DEEPLY to the Dharma of Amida Buddha to determine for oneself that the true teaching of Jodo Shinshu is indeed true. Having a teacher of settled SHINJIN is very important to helping one overcome their doubts, delusions, and obscurations. If Amida's Primal Vow is true, Shakyamuni's teaching cannot be false. If the Buddha's teaching is true, Shan-tao's commentaries cannot be false. If Shan-tao's commentaries are true can Honen's words be lies? If Honen's words are true, then surely what I say cannot be empty. Such, in the end, is how this foolish person [namely Shinran] entrusts himself [to the Vow]. Beyond this, whether you take up the nembutsu or whether you abandon it is for each of you to determine. HIGHLY RECOMMENDED: Click here For a series of YouTube videos by Paul Roberts on True Shin Buddhism. Yahoo Group: TrueShinBuddhism: A True Online Shin Buddhist Sangha. Amida-ji Retreat Temple, Romania Articles, Sermons and Publications on Jodo Shinshu Teaching. GODENSHO (Selection): Master Shinran's Challenge: Is Birth in the Pure Land Determined by Faith or by Practice?